This week we’ve been proud to announce a new course in the SensoBaby collection of classes: SensoReaders. SensoReader is designed for children in Reception and Standard 1. It is the first course that SensoBaby has offered for kids over the age of 5, but the course teacher, Priyanka Handa Ram, is certainly not new to leading school-aged children. Priyanka’s teaching experience/education spans over 10 years with a particular focus on literacy development and language teaching. She began her career teaching English at inner city London schools after graduating from the University of Oxford. In 2016 Priyanka taught English to Standards 5 & 7 at Thornhill Primary School. Priyanka has been leading Book Clubs & English Lessons at the REWA Education Centre since 2010, for children aged 5 all the way through to teenagers! 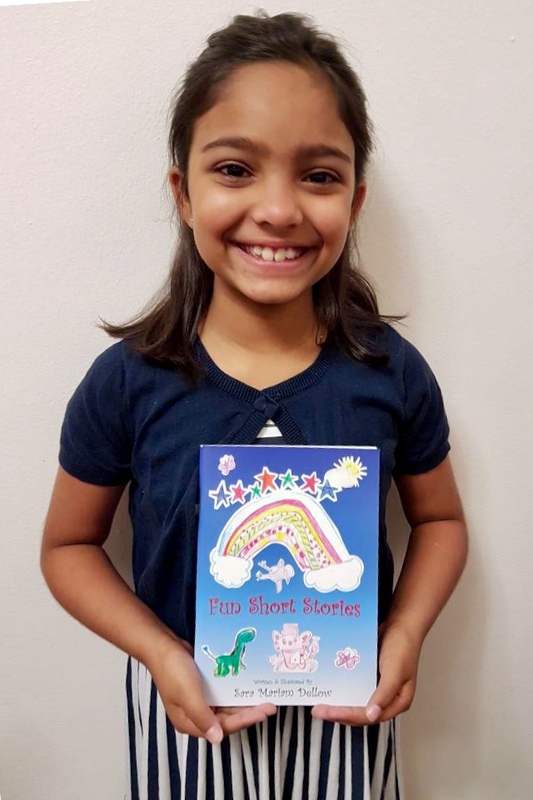 One student, Sara Dellow, has recently become one of Botswana’s youngest published authors. Her book launch was held in 2017 at REWA Education Centre, with all proceeds from the book sale going towards the BSPCA. 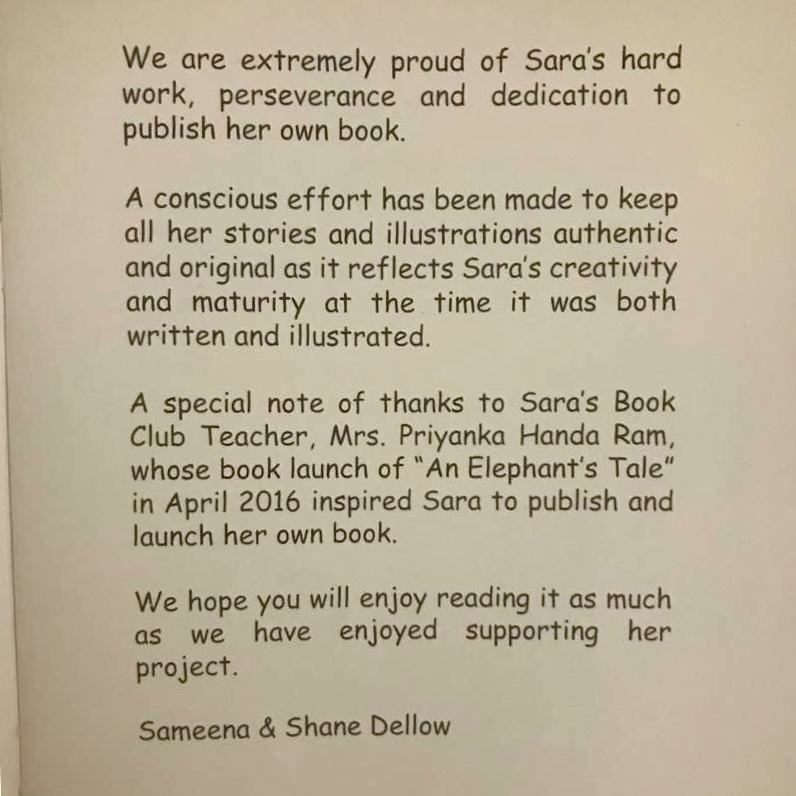 Sara wanted this because her mentor, Priyanka, had inspired her to think about animal conservation after the launch of her first children’s book, ‘An Elephant’s Tale’. “Book club is my favourite activity in the whole entire world. I would not miss it for anything …. unless my Mum doesn’t take me when I am sick. I started book club when I was 6 years old, in Standard 2 during the first term. I like book club because I LOVE reading (even though LOVE is not a big enough word to describe it) and I enjoy all the different kinds of activities we do. My mind map shows types activities we do. Putting on a play and finger painting were the must fun. Two of the poems written in book club are in my ‘Fun Short Stories’ Book. And some new short stories I have written will be in my next book. Well done, Sara. We’re so proud of you and excited to see what the future holds for you! “Sara has enjoyed reading from an early age and book club has been a truly excellent activity to encourage and enhance her love for reading, her vivid imagination, her vocabulary and her English; both spoken & written. The variety of activities undertaken always keeps her mind so active and encourages creativity. 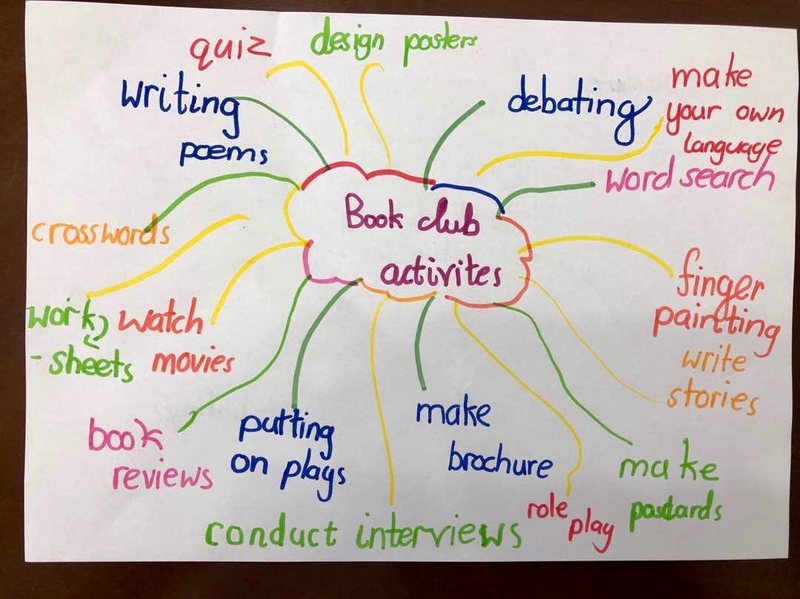 Credit goes to her book club Teacher Priyanka who is so passionate and makes the activity experience that much more fun , entertaining and delightful. Sara’s progress over the last 3 Years of participating in book club has been amazing – her reading age continues to soar well above her chronological age, and she continues to thrive in all subjects at school , as reading provides a great foundation in all areas. I particularly like it that book club introduces a wide and diverse range of books and authors which we otherwise would not have read. In addition, through this activity Sara was inspired to publish her own book, ‘Fun Short Stories’ which was launched in Dec 2016. It is a collection of short stories, poems and a song. The poems have since been published in Kalahari Conservation Society and Birdlife Botswana’s magazines. This has been the pinnacle of benefits as it provides an avenue for us to grow and nurture her interest. The dedication page of Sara’s book. Book Clubs can be powerful for readers of all ages. A good one will offer exposure and engagement to a variety of stories from around the world, building awareness, empathy, compassion and a love of books. SensoReaders, for children in Reception and Standard 1, starting 15 February. REWA Book Clubs for students in Standards 3-5 and 6-7 are held on Wednesday afternoons. Sara’s book, ‘Fun Short Stories’ is available to purchase. Please contact Sameena on 71781117 or email Sameenameghjee@hotmail.com. All proceeds from book sales are donated to the BSPCA.